Max Scherzer has been everything the Nationals had imagine when they signed him this past off-season. Scherzer is on a mean streak and has post so far this season a record of 8-5 with a remarkable ERA of 1.76. He has struck out 123 batters, according to Baseball-Reference and is on a roll to strike out more than 220 batters. He has walked only 14 hitters. Overall, Max has been impressive, but today he threw a no-hitter against the hot Pittsburgh Pirates. Max went the distance and struck out 10 Pirates. Scherzer lost the perfect game by hitting Jose Tabata with the pitch in the 9th inning with 2 outs. Scherzer is on fire! Also this is the second no-hitter this season. Chris Heston of the Giants threw the first one. Watch out MLB ! 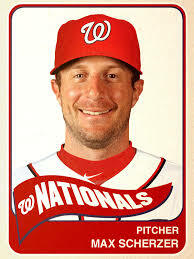 Scherzer is ready to go for a 2nd Cy Young award ! Previous Post My NBA Mock Draft ! Next Post What Will The Pacers Do ?